Right now Lowe's is offering this Bosch 18-Volt 1/2-in Cordless Drill for just $79 (Reg. $149)! Shipping is FREE on this deal. The Bosch DDB181-02 18 V Compact 1/2 In. 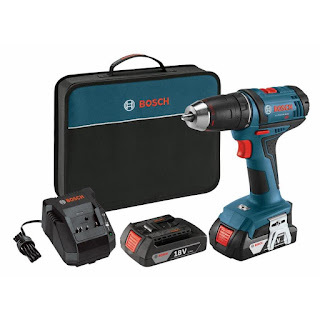 Drill/Driver delivers all-day professional performance in a compact and handy package. It has a two-speed transmission and 20+1 clutch settings, so it is ideal for the toughest professional drilling and driving applications. It provides 350 In.-Lbs. of torque for high-torque driving and 1,300 RPM for high-speed drilling. But this compact unit is only 3.0 Lbs. and has a head-length of only 7.1 In., making it the go-to choice for many pros who need a versatile and handy Drill/Driver. Built with tough Durashield™ housing, this cordless drill can withstand harsh jobsite conditions. It includes an LED light. The drill/driver provides Electronic Cell Protection to help increase the life of the two included 18 V SlimPack batteries.